There are several types of implant-supported dentures, and they all share some basic benefits. They can make life much more pleasant for denture wearers because they secure the dentures and significantly increase chewing efficiency. They won’t slip and fall out at embarrassing moments, they are more comfortable, and they can prevent bone loss. We’ll explore the different types here. Removable Implant Supported Dentures can be removed, but are far more secure than traditional dentures that are held in place by suction and your tongue. Removable supported dentures can be secured with as few as four dental implants, and with more implants, the stability of the denture and also chewing efficiency increases. Fixed Implant-Supported Dentures permanently replace a full set of teeth and prevent bone loss. Because of their strength, dental implants are the ideal anchor for dentures. When dentures are attached to implants, they will never become loose or slip. Implant-Secured Fixed Partial Dentures A bridge is a partial fixed denture that is used to replace one or several missing teeth. Without an implant, the bridge is secured to the remaining tooth or teeth. In some cases, this can loosen the anchoring teeth. Using an implant to secure the bridge leaves the surrounding teeth free of this pressure. Implant-Supported Bridges are flexible and stable, and they mimic natural teeth as closely as possible. Dental implants are used to support a series of attached porcelain crowns. 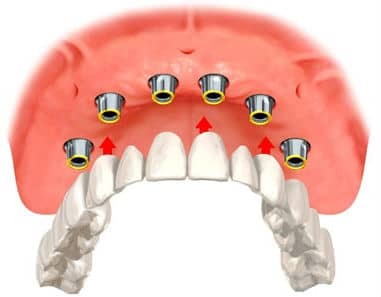 Implant-supported bridges may be used when there are a series of missing teeth. They are also effective when all teeth need to be replaced, using three upper and three lower bridges to provide a full set of functioning teeth. Whether you are considering a full set of dentures or a partial denture or bridge, implant support provides strength, stability, and durability for a long-lasting functional and beautiful smile. 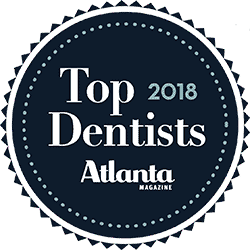 If you would like to find out which type of implant-supported denture would best fit your needs, give us a call or request an appointment. We’ll be happy to help you find a convenient time to come in for your examination.